Waste Paper Pulping Equipment Hydrapurger is mainly composed of front cover, casing, rotor device, base, transmission device, etc. feed pipe and heavy slag discharged pipe are arranged on the front cover. 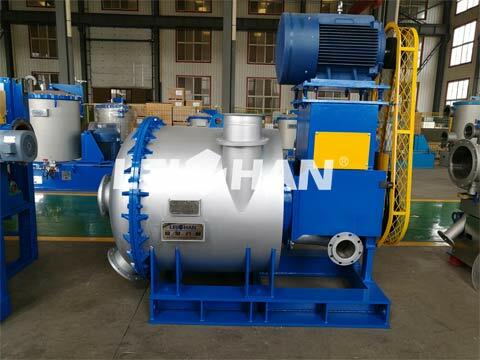 the front part of the casing is provided with a light slag discharge pipe, and the end has a flange connected to the slurry discharge plate in the rotor device, and the connection bottom plate on both sides is connected with the base. What Special Function Do Hydrapurger Have? Waste Paper Pulping Equipment Hydrapurger is used for removing light and heavy impurities of waste paper pulp in the process of waste paper pulping. the energy-saving VOKES rotor can avoid breaking impurities, and impurities can be discharged according to different specific gravity. Automatic control system of Waste Paper Pulping Equipment Hydrapurger make the process of impurities removal convenient and reliable. How To Install The Hydrapurger? 1.Pre-hook the anchor bolt on the equipment, lift the whole machine to the foundation (special lifting ring), adjust the level with the horn, the horn should be solid, and leave 25-50mm between the base and the base. clearance to grout into the reserved holes. 2.When the user fits the motor, it is necessary to check the parallelism of the main and passive pulleys. 3.After the equipment’s elevation, baseline, level, anchor bolt and horn position meet the requirements, concrete is poured into the reserved hole of the bolt.